JACKSON, Miss. — A skilled long snapper and a sure-handed holder. He had neither as placekicker for the Washington Redskins in the early 1960s. And that led Robert Khayat home to Mississippi, where he became one of the most influential administrators of higher education in state history. 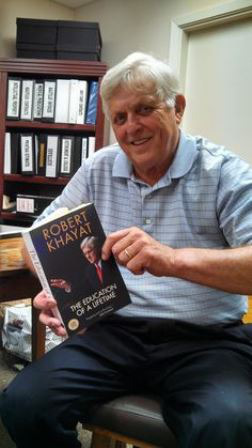 Khayat, now 75, was University of Mississippi chancellor from 1995 through 2009. Under his leadership, Ole Miss was awarded one of 280 chapters in Phi Beta Kappa, considered the highest honors society in the U.S., established the Jim and Sally Barksdale Honors College, increased enrollment by 70 percent and opened the William Winter Institute for Racial Reconciliation in 1999. He writes about his journey from his hometown of Moss Point to the chancellor’s chair at Oxford in his new book, The Education of a Lifetime, released Sept. 10 by Nautilus Publishing. And, yes, he wonders how his life’s path might have veered had his kicking chores been made easier in Washington. Khayat could never handle mediocrity. He wouldn’t stand for it at Ole Miss, his alma mater, where he was a tackle and placekicker on the Rebel squad that was awarded the 1959 national championship by four polls. He knew his first duty would be to deal with race. In 1962, violence broke out when James Meredith became the first African-American to enroll at Ole Miss. In the early 1990s, fans were still waving Confederate battle flags at football games. Khayat set out to disassociate the school from the flag, which was never endorsed as an official university symbol. The national media took notice and applauded Ole Miss’ stand. Some fans weren’t impressed. Khayat writes about receiving death threats. The FBI was concerned for his safety and that of his wife, Margaret, and their two children. “But I didn’t want bodyguards following me around,” he says. “I never believed anybody would kill me over a flag. Maybe I was naive, but that’s the way I felt. Khayat decided to attack the problem in grass-roots fashion: He and his chief of staff, Andy Mullins, began visiting nearly every high school in Mississippi. Ole Miss’ enrollment on the Oxford campus was hovering around 10,000 when Khayat and Mullins began their tour. It had grown to 17,142 in 2012-13, with minorities accounting for 24 percent. Enrollment surpassed 18,400 this school year. “His dedication to diversify the student body made a tremendous difference in changing the university’s climate,” Mullins said of Khayat. On Sept. 26, 2008, Ole Miss hosted a presidential debate between Barack Obama and John McCain.